Within the craft beer community, locally and nationwide, Upland and its head brewer Caleb Staton, have been getting recognition for their growing sour program. With each release the number of people trying to obtain one of these rare bottles increases dramatically, leading to some gaming of the release system that Upland currently employs. Upland chooses, for better or worse, to use a lottery system where the person picking up their single bottle* need only show a drivers license with the winner's name on it- this means anyone (this means you lambic lovers in Alaska!) with an ID and a photocopier could win and receive their bottle provided they could a) go to one of the Upland taprooms or b) find some generous soul to pick-up and ship the bottle to the them (aka muling). At times this tends to cause a lot of grumbling among the Indiana craft beer fans who happen to lose the lottery, but I digress. *Single bottle? Ha, their were stories of people picking up 40+ bottles at a time for "friends and family"... because who's grandma doesn't love tums-inducing liquified sweet tarts in a bottle? 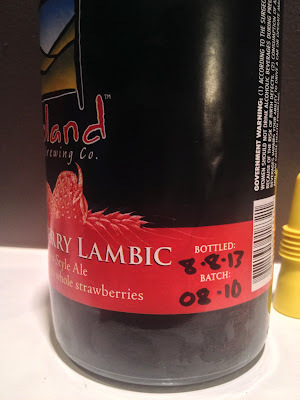 Now that all the frenzy of the Upland Sour lottery/muling/pick-up has subsided, it's time to actually enjoy these beers! And enjoy them now you should! 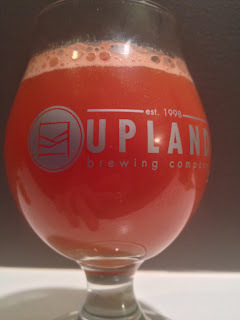 In talking to people close to Caleb, he has brewed these beers in a way that they are intended to Drink Fresh. Okay… seriously on to the beer. So what do we have exactly? 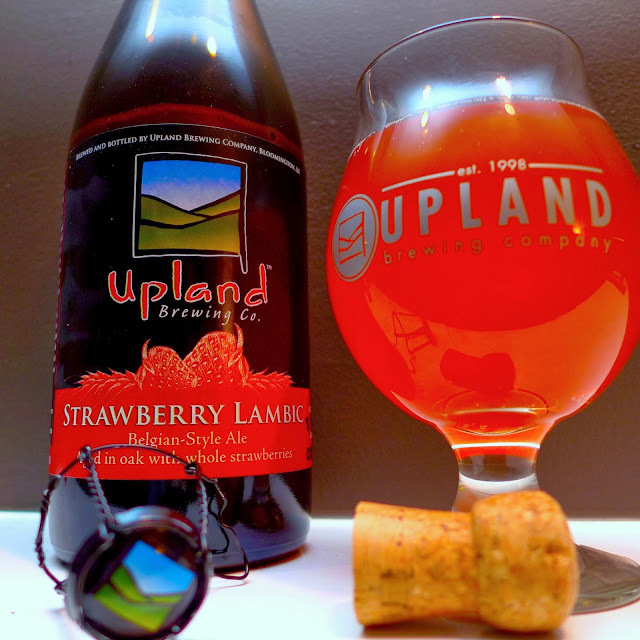 According to the bottle: "Upland Lambics are fermented by wild yeast and aged in oak casks for a year… we then add whole strawberries from Huber Orchard in Starlight, Indiana…"
I've heard stories of gushers on this release (be patient and properly chill your beer people), but nothing like that here as the cork comes off with a satisfying pop. It pours a murky, nearly opaque, pink with tinges of orange around the edges. Some light pink head with a vigorous pour (picture shows the last of the bottle and has some dregs), and forgiving the murkiness this is a very pretty looking beer. Aroma is very bright and fruity as one would expect, with notes of wild strawberries, lemon, green apple, and some general funkiness. 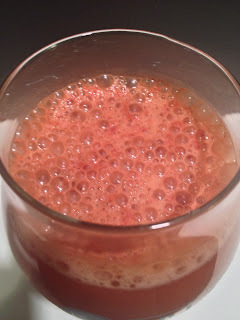 The flavor mimics the nose, but the funk and strawberries takeover with additional notes of lacto and oak, before finishing with some sharp (but not unpleasant) acetic acid on the tip of the tongue. The mouthfeel starts off light and full of prickly carbonation, but the beer gets fuller because it's so damn sour that you're mouth starts producing a bunch of saliva. Once you get past the swallow the beer finishes dry.